The only way this book could be more adorable is if it were also a stuffed animal. The main character mouse in question is so flippin' cute, I found myself wishing this book were a stuffed animal, or at least came along with one so you could hug it while you were reading and maybe ask if it was ready for you to turn the page yet. Wow. It's official. If a book is charming enough, it will turn me into a blithering idiot. Emmaline is a well-bred but adventurous mouse who moves into a New England house. 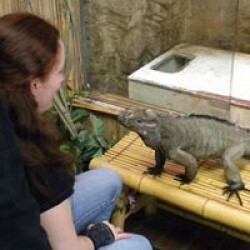 She soon realizes that she is sharing a chamber with a most unusual housemate: Emily Dickinson. Dickinson teaches Emmaline to love poetry and even to turn her paw to versification herself. These two shy, mischievous, nature-loving creatures communicate by leaving one another poems on bits of paper placed where no one else will find them. Dickinson favors helpless mice over marauding cats (a fancy supported by her verse as well as by her niece's recollections), and keeps Emmaline safe from harm. In exchange, Emmaline is fiercely loyal to her dear Emily. When writer/editor Thomas Wentworth Higginson pays a visit and doesn't properly appreciate the genius of Dickinson's work, Emmaline is so furious she knocks a vase over, "missing him by a hair." That's when I laughed. The ferocious expression the artist gives Emmaline's usually delicate features on this page is worth the price of the book, even if the rest of it weren't absolutely wonderful. The good news? It is. I saw I must decide once and for all whether to leave the Dickinsons' – as Emily never would. For although she was content with her life's "circumference," narrow but infinitely deep, I felt stirred to see more of life. I love that the author references the geographical smallness of Dickinson's existence while also acknowledging that this was what Dickinson had chosen, and what she needed in order to work – and her work was her life. I'm also deeply impressed that the poetry Emmaline writes doesn't present as mediocre next to Dickinson's verse, but in fact is so good that at one point I had to check and see if one of Emmaline's poems wasn't actually one of Dickinson's. I'm still in the middle of my Dickinson research, so I'm not sure what tragedy of ED's life Spires is referring to when she has Dickinson reacting with great agitation to the arrival of a letter. (Nerd outburst: I think it might be the death of Judge Otis Lord, but in this book ED's father is still alive when the letter arrives, and in real life Mr. Dickinson had died before Lord, who loved and was loved by Dickinson, passed on.) But the scene is beautifully handled, and shows a tender friendship between mouse and poet. After Emily falls asleep at her writing desk, Emmaline composes a lovely poem to console her, then carefully extinguishes the candle (another adorable illustration). The next time you're at the library, check this book out and treat yourself to 15 minutes of absolute delight. 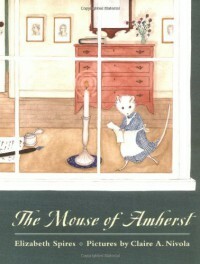 Even if you've never been especially interested in Dickinson, or poetry, or mice, this book is irresistible – and it's a terrific introduction to the life and work of the great poet of Amherst.